As CEO of Red Hat, Jim Whitehurst knows the company's seasonal patterns better than anybody. This week, he shared these elegant accounting insights. When Red Hat (NYSE:RHT) reported first-quarter earnings on Wednesday, the company supplemented its analyst-stumping 17% year-over-year revenue jump with a 20% annual increase in deferred revenues. That balance of cash already collected for services and products to be delivered in the future shows that Red Hat's long-term contracts are growing quickly, which is very much a good thing. But the deferred sales balance was actually down from the previous quarter. Puzzled over the disconnect, I raised this question in a phone conversation with Red Hat CEO Jim Whitehurst a couple of hours later. That's normal seasonality that all software companies have. You know, coming out of Q4, you have this massive amount of billings that we do at the end of every fiscal year. In every Q4, you're recognizing revenue from a whole year of deals. Just naturally, that burns off the deferred revenue balance. Our lowest point is always Q1 and it builds all year long. That's a normal phenomenon, just the seasonal nature of Q1 versus Q4 for any software company. That's why we always look at the year-over-year changes to compare those balances. So I fired up my trusty YCharts charting suite to verify Jim's claims. There's no question that he knows Red Hat's seasonal patterns better than anybody, but he went the extra mile here. Does this pattern really hold true across the software industry in general? In some cases, the annual pattern works out exactly as Jim Whitehurst explained. Oracle (NYSE:ORCL) "burns off" its deferred sales in the fourth fiscal quarter every year, and the first quarter often holds the lowest balance in each year. Symantec (NASDAQ:SYMC) has a slightly looser seasonal pattern, where the lowest point often occurs in the second quarter. Close enough, especially when the first-quarter deferred sales balance does drop below the second quarter on rare occasions. So Red Hat's contract revenue model certainly works for some other software stocks. Oracle is known for its rigid contract structures, so it makes sense for Red Hat to follow in the footsteps of this established software titan. Symantec has more exposure to the consumer market than corporate IT specialists Oracle and Red Hat do, so a slightly different pattern is to be expected. But there are outright anomalies, too. Microsoft's (NASDAQ:MSFT) fiscal year finishes at the end of June. That is indeed the typical high point for deferred contract revenues, but Redmond doesn't climb slowly up to the peak with a sharp drop-off afterward. It's the other way around, and the third quarter is Microsoft's expected low-balance point. 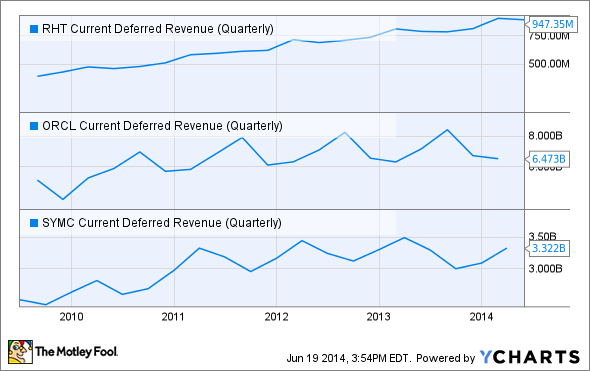 And Adobe Systems (NASDAQ:ADBE) tends to just raise its deferred revenue balance, quarter by quarter. There are a couple of exceptions where the balance drops temporarily, but no seasonal pattern to speak of. In Adobe's case, the company certainly does lots of business with corporations, from media production houses and publishers to the marketing departments of, well, everybody. But in Adobe's core market for creative production tools, there's also a rather large contingent of freelancers and small businesses. These don't always conform to the predictable fiscal schedules of your average blue-chip giant customer, and don't necessarily settle their software contracts at the end of any particular fiscal period. This introduces lots of wiggle room that works against normal seasonal schedules. 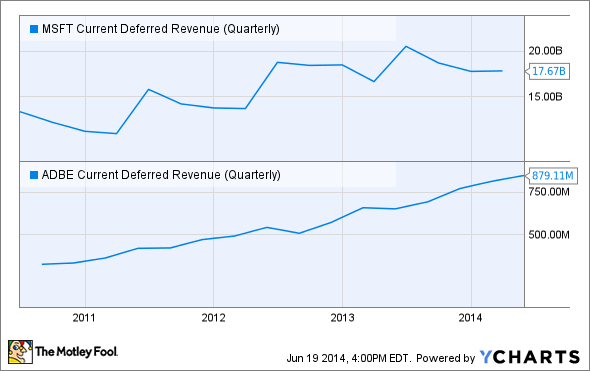 Microsoft's backward ramping of deferred revenue balances is a different beast altogether. Red Hat's model makes more sense for software vendors who see a large amount of renewable contract deals. Oracle is adamant on running this model, Symantec's corporate IT division loves it, too, and both Red Hat and Adobe largely abandoned one-time license fees several years ago. Microsoft doesn't play that tune quite as often. You don't buy a renewable multiyear Windows license with every Microsoft-powered laptop, desktop, and tablet. You get your permanent license -- and that's that. The same used to be true for Microsoft's Office suite, although the cloud-based Office 365 product has abandoned the single-payment licensing model. So Microsoft is moving closer to the contract model that Whitehurst described, but the company's revenue spikes in the second fiscal quarter (at the end of the calendar year) as corporate customers run their budget flushes. Deferred sales simply float along. Thanks for pointing out the seasonality of this important metric, Jim. As it turns out, the model you described holds true as long as we're talking about subscription-heavy business models. And the deeper into the pure corporate IT world I look, the closer these patterns match up with Red Hat's seasonal fluctuations. Next time, I'll know better than to worry about perfectly normal seasonality. And having done my homework, I've gained another tool for measuring the balance between direct sales and long-term contracts in the software sector.